The goal of this educational program is to enhance the efficacy and safety of stem cell mobilization for donors of patients with multiple myeloma (MM) by spreading information of the most current and effective methods to physicians. 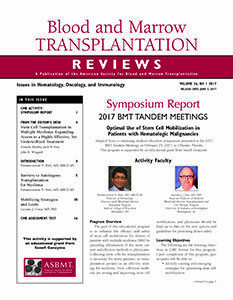 Collecting stem cells for transplantation is necessary for many patients, as transplantation persists as an effective strategy for myeloma. New collection methods are arising and improving stem cell mobilization, and physicians should be kept up to date on the new options and guidelines for protecting donor safety. This activity has been developed and is intended for transplant specialists, oncologists, hematologists, and other healthcare professionals involved in the treatment of patients with hematologic malignancies. This enduring material is approved for one year from the date of original release, June 5, 2017 to June 5, 2018. Parameswaran N. Hari, MD, MRCP, MS, discloses that he has received honoraria and served as a consultant for Sanofi, Celgene, and Takeda. Luciano Costa, MD, discloses that he has received honoraria and research funding from Sanofi and from Amgen, and has received honoraria from Celgene. He has served also as a consultant for Sanofi. Hemant Murthy, MD, has no relevant financial relationships to disclose.